A longer 3 series will be available in three models: the 335Li, 328Li and 320Li (shown) and will be built at BMW's joint venture assembly plant in Shenyang. BERLIN/SHANGHAI (Bloomberg) -- BMW is making a bigger version of its popular 3-series sedan in a bid to tap into Chinese car buyers' taste for larger cars and lure them away from the likes of General Motors Co. 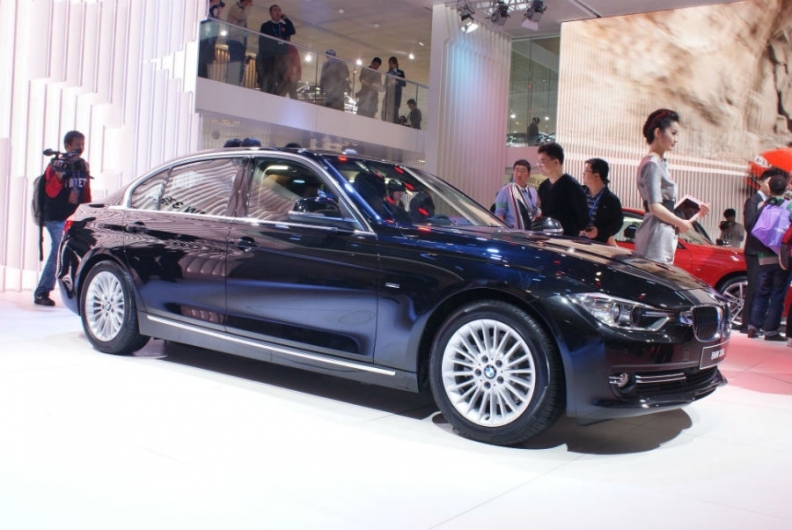 The stretch 3 series, made uniquely for the Chinese market, is 110mm (4.3 inches) longer than the regular model and is part of a broader effort by German luxury-car makers to sell more cars targeted toward first-time buyers in China, after years of focusing on selling their priciest models. "The premium market here is developing from the top downward," Ian Robertson, BMW's sales chief, said this week at the Beijing auto show. "Over time, you will see the smaller segments growing more rapidly." The small car market in China is currently dominated by high-volume manufacturers such as General Motors. BMW, Mercedes-Benz and Audi are expanding into that market to boost growth and lessen reliance on their biggest models like the 7 series, half of which are sold in China, as overall car sales in the country slipped 1.3 percent in the first quarter. Larger sedans and SUV's accounted for at least 70 percent of premium car sales in China last year compared with 40 percent in Germany, according to Bernstein Research. "The second generation of the rich Chinese is growing up and shopping for cars," said Cui Dongshu, deputy secretary general of China's Passenger Car Association. "Luxury automakers want to lure those young customers with lower-end product and prepare them to trade up." The German automakers, the world's three largest luxury car producers, stand to gain market share in 2012 in China as wider offerings puts pressure on mass-market manufacturers. Those carmakers have also been more sensitive than the luxury brands to China's weaker economic growth, which decelerated to its slowest pace in nearly three years. At the Beijing show, Mercedes showcased a pre-production version of the CLA four-door coupe, the smaller cousin of the 59,860-euro CLS. Audi presented concepts based on the Q3 compact SUV, which will be imported into China starting this year, following the A3 hatchback and A1 subcompact that went on sale last year. The extended version of the 3 series marks BMW's second model designed specifically for China after debuting the long-wheelbase 5 series in 2010. "Here in China, people are aspiring for their first car, and they go for entry level," Daimler CEO Dieter Zetsche said to reporters in Beijing. "The ultimate aspiration is to arrive at the top segment. That definitely plays into our hands. There's tremendous opportunity." Growth in China's luxury-car segment will probably be in the range of 15 percent to 20 percent, more than triple the total market's 5 percent gain, Zetsche said, adding that demand for upscale cars could outpace the overall market for "years." Mass-market brands like Toyota are already starting to feel the impact of the expansion by the German brands, which dominate China's luxury segment with a combined share of more than 75 percent. German premium automakers' introduction of offerings in the same customer segments as Honda's Accord mid-sized sedan is making it harder to boost sales, Takanobu Ito, Honda's president, said in Beijing. A Mercedes A-class compact sells for as little as 178,000 yuan (21,430 euros) at a dealership in Beijing's Chaoyang district, according to figures by auto pricing Web site cheshi.com. A Honda Accord with a 2.4 liter engine starts at 172,400 yuan (20,760 euros), cheshi data shows. Tokyo-based Honda is seeking to make its cars more "price competitive" by cutting costs and is also tailoring of the Accord to Chinese tastes, Ito said. "Prices of luxury cars are coming down to a more reasonable level," said Dong Haiyang, vice president of BAIC Motor Corp. "The discounts by luxury carmakers are adding more pressure on the cars that carry price tags between 250,000 yuan and 300,000 yuan by offering consumers choices of having a premium brand car with about the same amount of money." After getting her driver's license, Mandy Zhao, a school teacher in China's bustling coastal region, wasn't sure at first that she'd be able to afford the silver-grey Mercedes B-class compact that she eventually bought at the end of March. "I initially had the impression it would be out of my reach," said the 58 year old from Suzhou. "I realized how wrong this impression was. Prices on some models are reasonable and still within reach of middle-income earners." To win over Zhao, the Mercedes dealer offered a discount of 70,000 yuan ($11,100), or 23 percent off the 310,000-yuan sticker price. The Germany-based automaker plans to make the model more competitive by assembling the vehicle in China to eliminate import duties. "Competition will become more and more intense," said Jenny Gu, an analyst with LMC Automotive in Shanghai. "The slowdown that has currently hit cheaper, smaller car sales will one day spread to the higher-end cars." BMW and Audi will also start building smaller cars in China. A new BMW plant in Tiexi, which will start production next month, will make the X1 compact SUV. Audi plans to build the Q3 locally. The competition means that there is a pressure on mass-market brands to stand out too. Italy's Fiat unveiled the Viaggio sedan in Beijing this week, marking its latest push into China. It plans to use a Gucci edition of the retro-styled 500 minicar to distinguish itself from VW and other mass-market brands. "China is probably one of the most competitive markets in the world," Olivier Francois, head of the Fiat brand, said in an interview. The Gucci 500 helps the carmaker stake out its "own territory" as luxury brands expand into lower segments. China is a sought-after market because of the fast pace of growth and the higher prices. The country is currently the top market for the Mercedes S class, even though the vehicle costs the equivalent of $147,500, 60 percent more than the U.S. starting price of $91,850. The higher prices help BMW, Audi and Mercedes earn average profit margins of about 16 percent to 18 percent in China, compared with 10 percent to 12 percent globally, according to Credit Suisse. Still, holding on to customers remains a challenge. "Chinese buyers are brand conscious but not brand loyal," said Ashvin Chotai, managing director of Intelligence Automotive Asia in London. "As the market matures and buyers have more experience, brand loyalty will slowly evolve." To that end, getting customers early may help. Mercedes at any rate has a good shot at holding on to B-class buyer Zhao. "I'm happy with the car," the school teacher said. "It's a comfortable drive and good value for the money. If we did have the intention to upgrade, I would definitely consider a Benz."